Discussion in 'Defence News' started by vikasdangi, Apr 1, 2018. Ten months since it reoriented the mission pattern of its fleet, the Navy has told the government it has the Indian Ocean covered with an alphabet soup of acronyms. GULFDEP to MALDEP is the new naval lingo to describe the Indian Navy’s area of responsibility. The re-orientation to “Mission based deployments” (MDP) has meant that nearly 15 warships of the Indian Navy are patrolling seven areas of the waters around India, beyond the country’s Exclusive Economic Zone (EEZ), keeping an eye on all entry and exit routes to and from the Indian Ocean. The ships are tasked round-the-clock, round-the-year. Each warship is turned around after three months. The last of the deployments for the year since the new pattern was begun in end-May 2017 and announced in October 2017 has just started. Warships generally avoid sailing through the international maritime highways, unless specifically tasked, and usually go from point A to point B in zig-zag pattern to cover more area. Many of the Sea Lanes of Communications (SLOCs) that international mercantile marine traverses also sit astride part of China’s vaunted “Maritime Silk Road” from the South China Sea to Africa. Nearly 80 per cent of China’s energy supplies go through these routes. IODEP: patrolling in the South Indian Ocean, off Mauritius, the Seychelles and Madagascar. In addition to these deployments, Long Range Maritime Reconnaissance (LRMR) aircraft – the Boeing-made Poseidon 8i planes – are tasked with flying sorties, sometimes up to the South China Sea, almost every day, from INS Rajali in Arakonnam, Tamil Nadu. Over the months since the MDP, the acronyms that began as colloquialisms have become part of navy jargon. “We have the Indian Ocean covered,” a top officer overseeing the deployments told The Sunday Standard/The New Indian Express this week. “From GULFDEP to MALDEP, we can see every Chinese vessel, most certainly,” he said. He was referring to surface ships of the Chinese Peoples’ Liberation Army-Navy (PLAN). Chinese submarines were spotted, when they were, more infrequently. 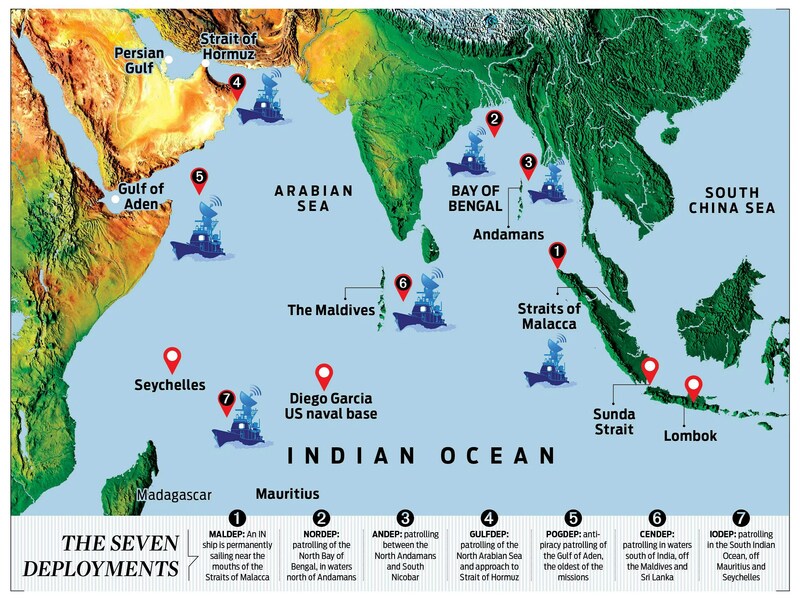 In December, the navy chief, Admiral Sunil Lanba had said that at least eight ships of the PLAN were in the Indian Ocean Region “at any given time”. These included three for their anti-piracy patrol that China too began in 2008. Twice a year, PLAN submarines criss-crossed waters close to India in an anti-piracy deployment that befuddles most navies. It is not understood why submarines should be used as platforms to counter piracy off the Horn of Africa. The pattern of Chinese deployment in the IOR was markedly different in August last year when the number of PLAN vessels suddenly rose to 14. The Indian Navy also picked up a Chinese flotilla that sailed through the South China Sea, entered the Indian Ocean through the Sunda Strait, took a U-turn, and returned through the Strait of Lombok in February this year. The manoeuvre coincided with the turbulence in the Maldives. But the flotilla was far from the archipelago. The intelligence collected by the seven Indian Navy deployments is fed into, apart from the Directorate of Naval Operations (DNO), the Information Management and Analysis Centre (IMAC) near the national capital. The navy has its own satellite, Rukmini.